I have had a couple of New users try and join forum but they do not seem to have joined. Does anyone know of users that have tried to join but have failed? As admin I set myself up to check them out as they join and I get the following error message. For example someone called Florri tried to join today. The requested URL /profile.forum was not found on this server. Not sure if this is tied into whatever is happening to the main web site at the moment? As that site no longer looks the same is now missing the events page and I can not log in as admin as I used to be able. I presume Justin is still working on it and will mention when it is finished? May or may not be the same thing, but I've noticed something similar at times in the past Mark. I get an email notification when someone new joins, and it gives me a link to click on to see further details. When I do however, I invariably get a similar message. It may even say Not Found. Notwithstanding that, I have normally then see the person successfully post! Your post sent me a note saying you had responded to me. The requested URL /t962-new-user-problems was not found on this server. I have a feeling it is something that is being done to the main web site has broken something, not sure how as two should be different from one another! If Justin sees this can you have a think on what you have been doing and what it may or may not have done? I am trying to find some support from the providers of this forum software but don't hold out too much as I think it could well be down to us? Ok. Have alerted the guys working on the website upgrade. Thxs I have posted on forum motion help forum to see if they can help. But looking at error message I think it is tied back to our main web site and domain and I think there will be setting that has not been turned on or set up in the main web site. It is not a simple upgrade process. Well I’m sorry to say this has got me puzzled. I can understand why any links from the Forum to the old Kriegsspiel News web site wouldn’t work. For example “Kriegsspiel.org.uk Events” link on the home page. That page doesn’t exist on the new site yet. And when it does I doubt weather it will work because the URL will be different. But why when people try to register on the Forum it’s trying to link back to the News web site is a bit odd. It’s my understanding the News Site and the Forum are independent of each other. OK I have found the place where I can find the users who have joined but not activated their accounts and I can now activate them. The issue is that e-mails being sent with links to this site are not linking properly. I think this is down to how we have the main web site and hosting set up. If I still have access to the hosting site / set up page I will have a look but as this has in effect been taken over from me I am reluctant to muddy waters. So can I ask Justin and Hays to give this some attention. I can ask for further help at the link shown above as they might be able to point us in right direction. This gets the 404 error message!! So now need to understand what is happening to make that happen? I think this points clearly at the way we have things set up and something has changed. What? Martin James contacted Richard Madder the originator of the Website and the Forum. He advised that he set them up so that they appeared that the Forum was part of the same domain as the Website. Unfortunately he can’t recall how he did this. I am trying to contact a colleague in our IT department at work to see if he can help. But it would appear that something needs to redirect the links from the Website to the forum. Did you manage to find a work around with new people registering on the Forum? I can know see Florri in the Memberlist. Sorry didn't see your precious post. Hi Hays, any progress on this? We are getting new users at this forum and anyone getting an e-mai, from here can not follow the link. Martin chased me yesterday about a user re-setting his password and I see we have a new user that I will have to go an activate as they will not be able to follow e-mail. FYI - The message I posted at Forum help has not got any responses other than tell me how to activate new users manually. Unfortunately still no answer to the problem. There are a couple of things I think we can try. This will then link to the correct location. This is what I did for the user re-setting his password. Perhaps we can put something on the home page of the Forum and the Web site advising of the registration problems and detailing the work around. I did have a look at if something was set within the forum and will look again. Ultimately I will have a look and use google to find the answer. I found this on the Forumotion help. I think this is from when the original Web Site & Forum where set up. What do you see in the back end of the forum if you follow this path. It may give us an idea of how this was originally setup. I have checked each of those and nothing leaping out at me to match what you say re Personalised Address. "Only the forum founder can do this manipulation. Normal Admins can not see this section in the admin panel. "This option is not here to change your forum address every day!! When you change the address, all the referencement you did under the former address is lost. You have to have your forum indexed again on different websites and search engines. Exclamation There is also a timeframe (24 to 48 hours) in which your personal avatars and smilies aren't displayed. Re-installing won't help in this case - you have to wait until they re-appear again by themselves." So while this might work, there is still something else to understand what has changed to break this from working in the first place? My colleague at work had a stroke of Inspiration. 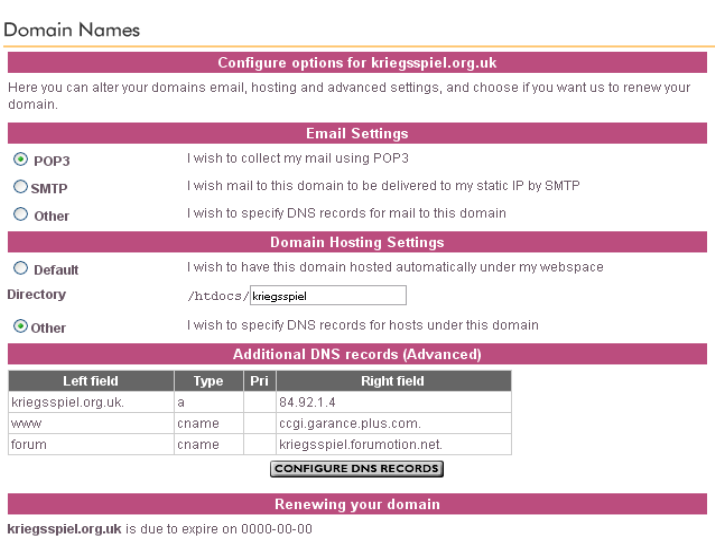 We posted a support request on the Krieggspiel News hosting sight X9 to create a “Cname” (whatever that is) against the domain name to redirect. I got a response from the Hosting Site to say the redirect would be active from this morning. Just tried it and it works. Can you try it and just confirm it’s working for you. Well found and BTW the event details on the main web site look good. It would appear we are now having problems with users trying to get access again. To help solve this we need some information from those who have had the problem. 1. What Web Browser did you use to register? 2. Did you get an e-mail confirming your registration / activation process? 3. What if any error messages have you had? 4. For those who have not got in we can manually activate you - so please e-mail admin and these messages will get to us, even if you can not post on forum. Looks like Cname might be broken at X9? http://kriegsspiel.forumotion.net/act?u=3&ak=b5bf5bc44 it works but shows that user has already been activated (Martin has done manually). So new Users to activate can you do the change mentioned above in this thread until it is resolved. I used to have all this setup so the forum looked like it was part of the domain when I ran the site/forum, though of course it is hosted by forumotion. The forum link on the web site goes to http://kriegsspiel.forumotion.net/, I used to have it set up to http://forum.kriegsspiel.net & that worked because I had set up the redirection, damned if I can remember how I did it, but ISTR setting up a CNAME in my ISP control panel at some point. I also had www.kriegsspiel.org.uk showing the main web page, that now shows a badly formatted version of same (I'd guess can't locate its Joomla template, if you are still using that CMS).